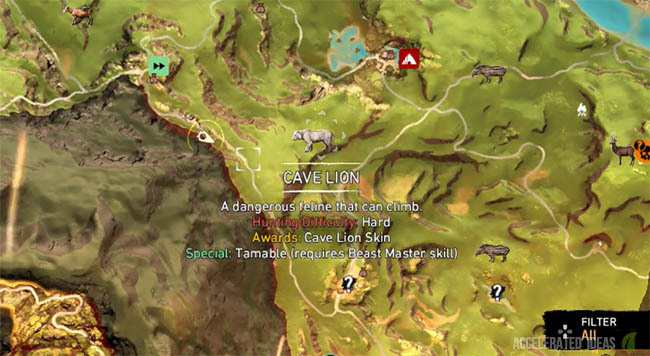 Far Cry Primal - Animals won’t appear - Can't tame beast? 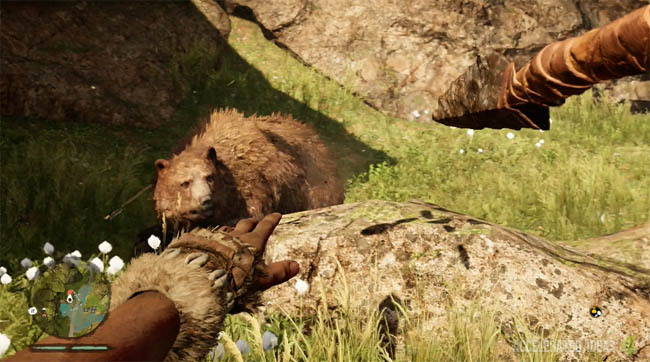 Finding your desired animal and successfully taming it is one of the hardest tasks in Far Cry Primal. Sometimes animals won't even appear and many players struggle to actually find the animal they are looking for. In this post I'll help explain how to find particular animals and help you understand why they are not appearing. First of all make sure you're in the right area for the animal you're looking for. This is quite easy to check by simply opening the world map and hoving over the animal icons. These icons are reliable indicators for the natural habit of certain animals. Common animals can be found throughout the map, for example Dholes, Boars and Goats are pretty much everywhere at the beginning of the game. However, rarer animals such as the Jaguar, Cave Lion etc. will stick to their chosen regions. Don't make the mistake of thinking that the animal icon is the precise location for the animal, instead it's a marker for a small region, you are expected to explore the surrounding area for the animal. Every animal has a spawn rate which controls when they appear in the game - this can make some animals appear infrequent and lead players to think the game is broken or that they're in the wrong place. Common animals such as goats and deer have a very low respawn time making them very abundant in the game. Other rare animals such as the Leopard, Jaguar, Cave Bear and Sabretooth will spawn very infrequently, making them very difficult to tame. Once you've reached the animals known location, patrol the area by running circles. Take time to explore above and below the hills, either side of cliffs. Sometimes the animal will be roaming the other side of the hillside, completely oblivious to you. Above all be patient. It can take time for the animal to actually spawn into the map. You should also note that animals also despawn out of the map so be careful when chasing animals around carelessly. Hunter vision turns the screen a faded colour, immediately highlighting nearby animals in yellow. Unfortunately it also highlights resources as well which can be confusing. Keep a close eye and check if that yellow shape is moving and the general outline for the animal. It's usually quite easy to spot the difference between say a boar compared to a wild cat. 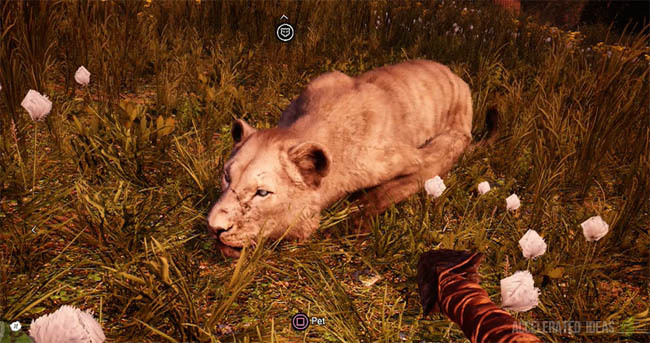 The natural world of Far Cry is actually quite dynamic, with other animals entering into typical prey and predator encounters. This gives you a great opportunity to spot the predators which also appear on the mini-map with red dots. For example, during one of my early games I saw a pack of deer running away from a Dhole who was giving chase. Both the noise and the alarming speed that the deer were running at were giveaway signs that a predator was nearby. I found that vantage points during the day were helpful, allowing me to scout the area for animal movements before going in for a kill or tame. The day and night cycle not only changes the visibility level entirely but it also changes animal behaviour. During the day, predatory animals will rarely venture outside of their natural habitats. At night the complete opposite is true, allowing you to find more predators within close reach. 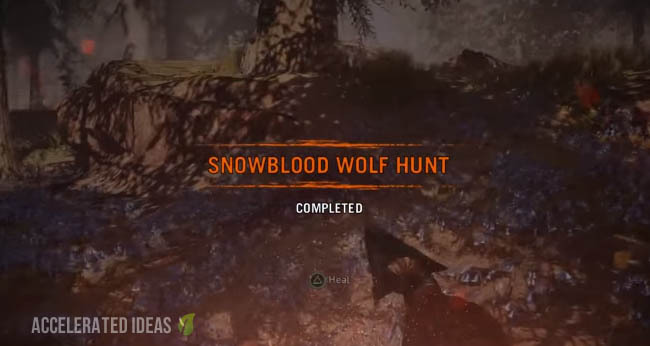 Although this doesn't really help you pinpoint a particular predator it's still useful if you're looking for common beasts such as wolves or you would like to take a chance on finding a rare animal without having to travel great distances. You can switch from night to day by sleeping at one of the campfire locations.